Nearly everyone today who watches television or reads the newspaper knows that in the automotive industry, things have progressed a long way. Back-up cameras, touchscreens, self-driving cars of the future, how far will it go? At CarMark Hawaii, our business is buying used cars for cash, however we know even in the used car industry, things have changed dramatically in the past 20 years or so. Technology is amazing, no doubt. 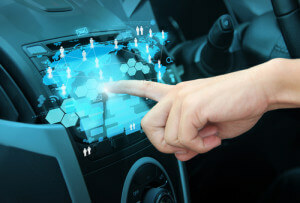 Everyone has a smartphone or tablet that can be controlled simply by touching the screen; now, it’s becoming the next big thing in the automotive industry. A car with a touchscreen is great, right? It seems like a good idea, until you really give it some thought. One person who contributed an article at Slash Gear has a little bit of a different opinion, and it really does make sense. In older vehicles, drivers could simply “feel” for a button or knob when controlling the radio, air conditioning, or other features. This made it less necessary for drivers to take their eyes off the road as much, compared to a touchscreen, which you have to look at to control. Whether turning on the radio, changing the station, or controlling the AC, drivers have to first find the right area of the screen with their eyes, then touch the screen to control whatever function they’re dealing with. We all know that distracted driving has led to countless accidents over the years – and what’s more distracting than looking at a touchscreen? It requires looking away from the road, maybe not such a great idea, at least to some. While most automakers today have a touchscreen dashboard, one has added physical buttons drivers can feel, which sends a message about the potential dangers of touchscreens. Ford ended up backtracking, perhaps a smart idea! Touchscreen and touch controls are certainly the wave of the future, but maybe more automakers will figure out how to make all of this new technology work without requiring drivers to take their attention away from the road. If you live on Oahu and want to sell your used car for cash, trust CarMark Hawaii, your local Honolulu used car buyers, for a fair deal. No hidden costs or fees, simply fill out our online appraisal form or give us a call! We buy used cars that are 2007 models and newer, with a straight body and 100,000 miles or less. It’s easy, whether your vehicle is paid for or not!